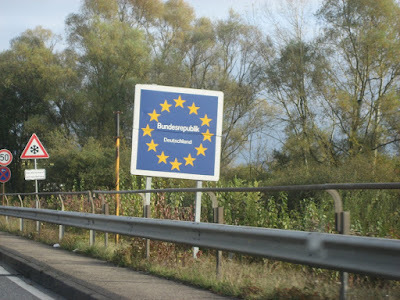 Alsace is on the border of Germany, so I crossed the Rhine River and entered Germany. Before long I was enjoying autobahn driving. Despite popular belief, you cannot drive as fast as you want on the German motorways. First of all, there are many places where speed-limits are explicitly set. When you are approaching, traversing or leaving a metropolitan area there is always a speed limit (90 km/hr or 110 km/hr are common). It's mainly in the country where there are no posted speeds. Even in the country, however, you encounter plently of sections with posted speed limits. But even in places where you are permitted to drive as fast as you want, there is often enough traffic present to prevent you from doing so. And the fact that gasoline is so expensive can also dissuade a person from driving too fast. I have to admit that these things probably add up to the reason why I survived driving on the autobahn. I feel I am a very cautious and alert driver, but when a person is driving more than 200 km/hr it doesn't take much to cause a fatal accident. Still, I was able to get the car past 220 km/hr. I started to reach for my camera to take a picture of the speedometer. Then my common sense (which lacks the acceleration of a BMW) caught up with me and I decided that I would just concentrate on driving.